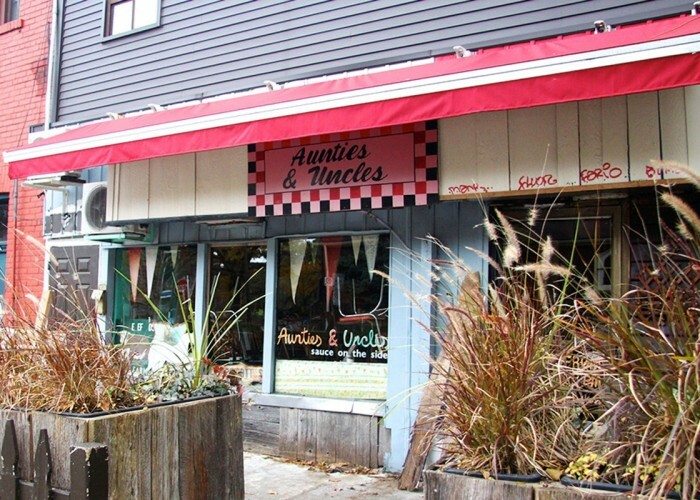 Russ Nicholls opened Aunties and Uncles in 1998 with humble ambitions. Russ, a native of the Waterloo-Kitchener area, was living in Kensington Market while taking cooking classes. He had worked in the restaurant industry since he was about 13 years old and enjoyed the high-energy creative process unique to working in the kitchen. In the 1990s Russ became inspired by places like Mimi’s Diner and Jet Fuel. “She’d sometimes get cranky with customers, but she had her own thing going on,” Russ says of the owner of Mimi’s. These places made an impression; he realized that you don’t necessarily have to throw around lots of money and be slick to make an impact in Toronto. “I basically started with nothing”, Russ recalls. “I was always drawn to places that weren’t fancy but had the most character and personality.” In high school, Russ liked the 1960s mod style in England, and this would late inspire the signature style of Aunties and Uncles. The walls of Aunties and Uncles are decorated with retro artefacts that owner Russ Nicholls has collected over the years. Russ decided to rent the storefront on the corner of Lippincott Street and live upstairs. Between his various side jobs, he would squeeze in time to operate the cozy diner on the ground level, which was mainly busy on the weekends. 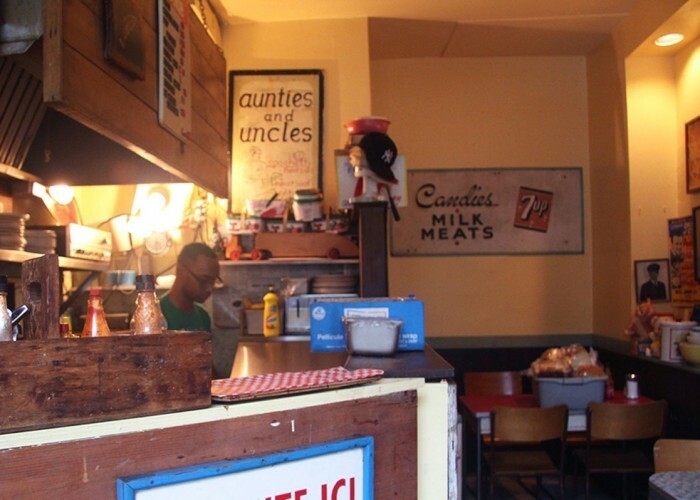 He installed a very basic kitchen — what he lovingly calls a “makeshift operation” — and collected vintage artifacts and signage to decorate the walls. The original Aunties and Uncles menu was scrawled on a chalkboard and fresh juice was prepared from a manual juice squeezer. “It was like you were visiting someone at home,” Russ says. 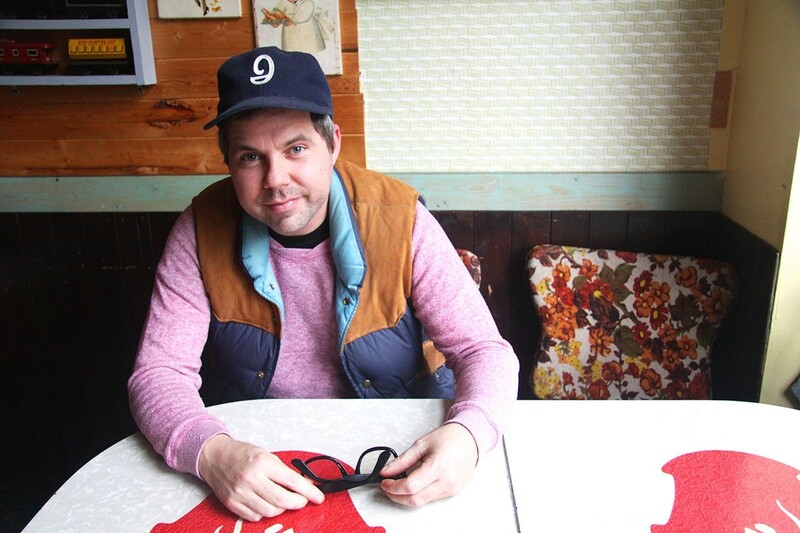 About six months after Aunties and Uncles first opened, Russ developed a friendship with soon-to-be restaurateur David Ginsberg (owner of White Squirrel and Parts & Labour). The duo would discuss the restaurant industry for hours and eventually David would become a business partner and help to establish Aunties and Uncles as a competitor on the Toronto brunch scene. Business began booming and the humble café grew into its own personality. Aunties and Uncles seats about 20 people inside but sees up to 250 on a good day. Russ took back sole ownership of Aunties and Uncles in 2008. 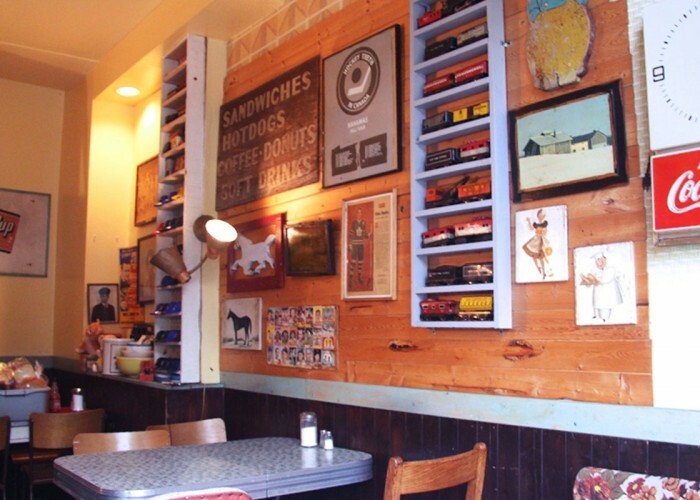 Since then, he’s cultivated a regular crowd of loyal patrons and the cozy space is usually packed with hungry locals. The brunch menu offers Canadian classics like the BLT sandwich and cinnamon French toast; but staff members agree the most popular choice is the breakfast taco, which features scrambled eggs, pinto beans, cheddar and house-made chorizo sausage stuffed into a soft corn tortilla. Russ takes pride in the fact that he’s only raised prices a marginal 50 cents in almost a decade. “I like things to be as affordable as possible,” he says. The reasonable prices and retro vibe have made this west end café a perennial neighbourhood hotspot. Loyal customers continue to line up down the street every weekend for their home-style brunch fix. And although Russ says he can’t chat with people over a cup of coffee like he use to, he still recognizes familiar faces among the crowd. The front patio at the Lippincott St. entrance is a busy spot for diners in the warm months.